Sprucing Up My Cheese Making By Giving Them The Strap! This past Christmas I was given some cheese making supplies, and in my stocking I found these peculiar things that looked like paint stirring sticks. They weren’t, I was relieved I thought my wife was hinting at a reno project, they were spruce straps used for wrapping cheeses such as Vacherin or Mont d’or. Well March has rolled in like a lamb and I figured it was time for me to use them. 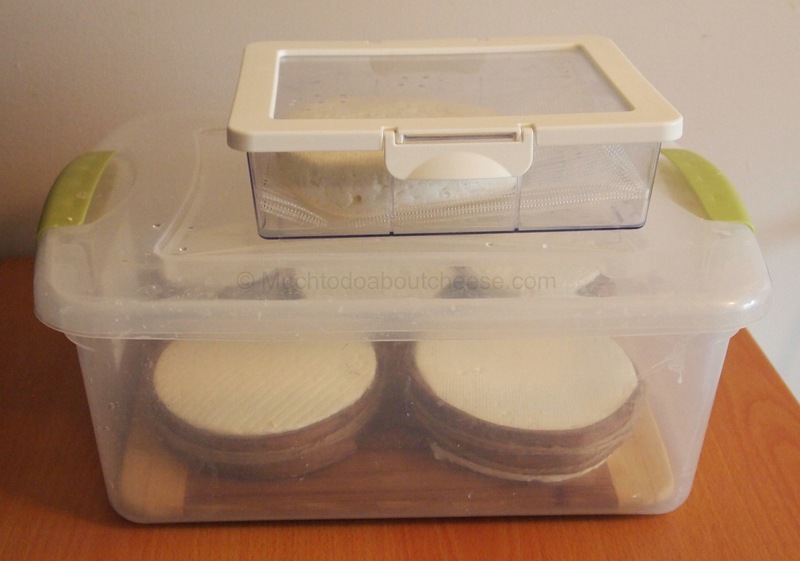 So armed with 14 litres of “HomeMaid” and extra fat whole milk, my trusty Reblochon and basket mould it was time to spring into cheese action. 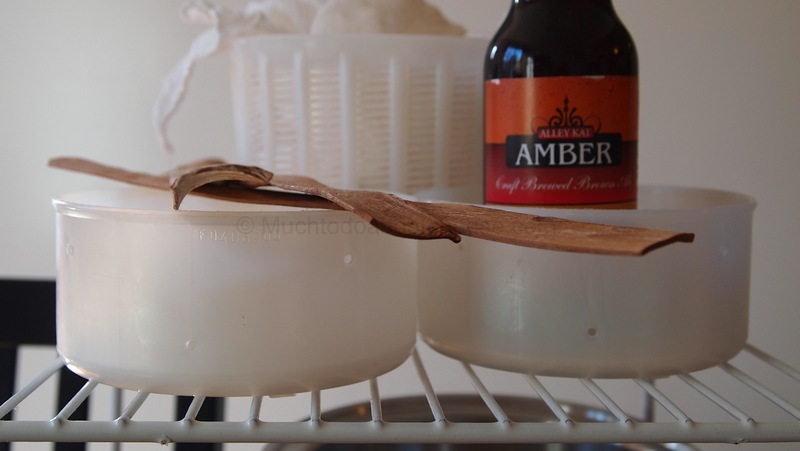 Spruce Straps, Moulds and Alley Kat’s Ambert Ale. A match made in cheese heaven. I decided that I would use the Reblochon recipe I have, but wash the rinds with a Amber Ale by Alley Cat Brewery, from right here in Edmonton. With this goal in mind it was time to start.I have used this Reblochon recipe a few times with good results, so I was not going to mess with it, except for the fat content in the milk. The make was to plan, except my yield was higher than I expected. I had to quickly sterilize a few more moulds. After there first set of cuts I let it rest for 5 minutes. I love the sheen that the cream gives with the flash. 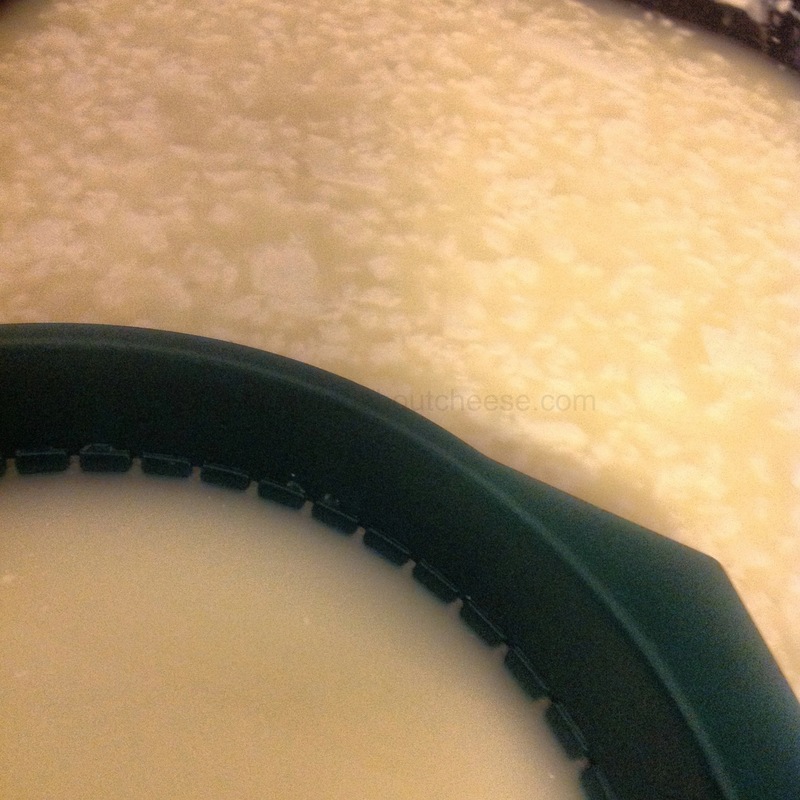 After cutting even smaller and stirring for 30 minutes it was time to start to drain the curd. 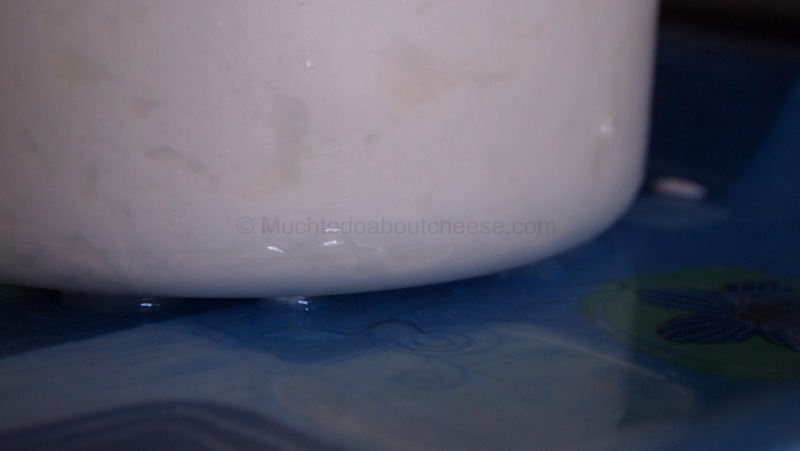 I think that I should have tried to get the curd smaller, that happened in the last batch and they turned out well. 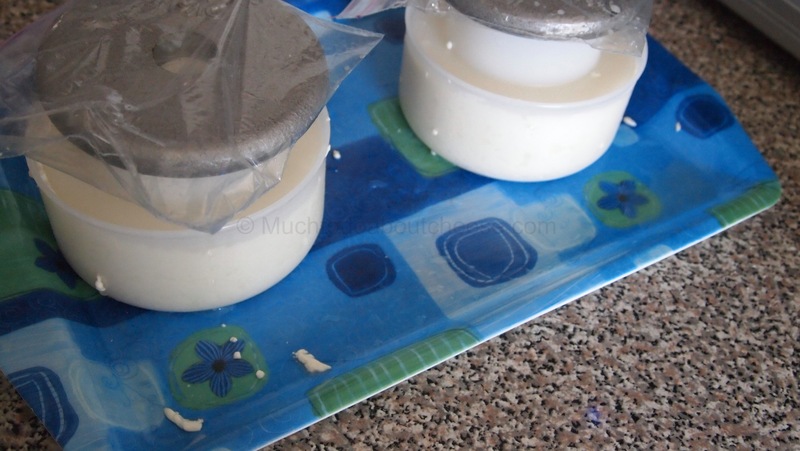 One of the key steps with this recipe is you need to transfer the curd to the moulds with the whey. 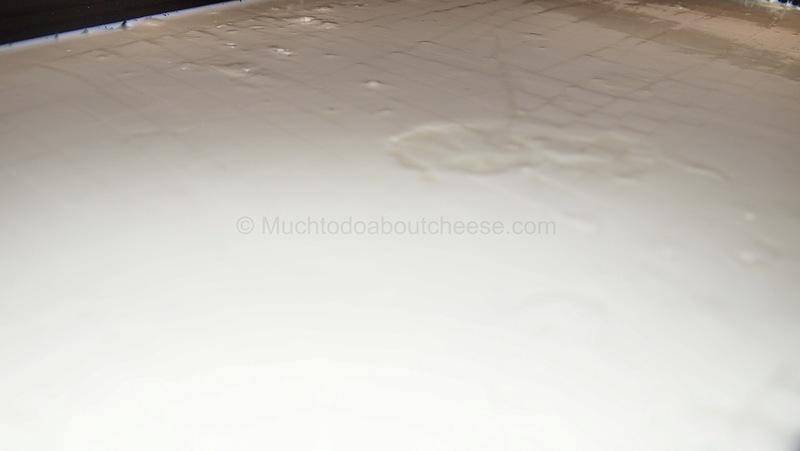 I chose not to use cheesecloth this time, to allow for the curd to drain better, and to get more in the mould. 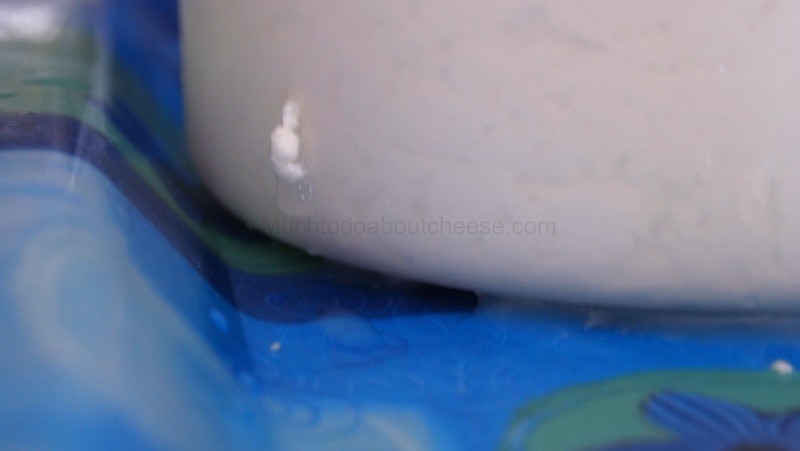 I had to improvise with the pressing of the cheese, I usually use a couple of 2.5 lb weights but this was not an option for the other moulds. 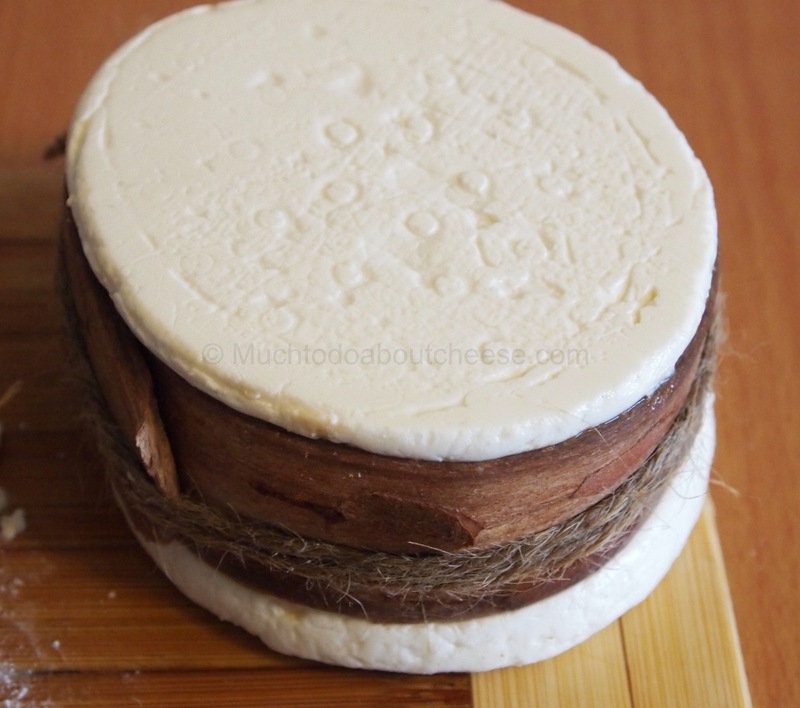 When I started making cheese I DIY’d everything. Good thing I remembered the cans. 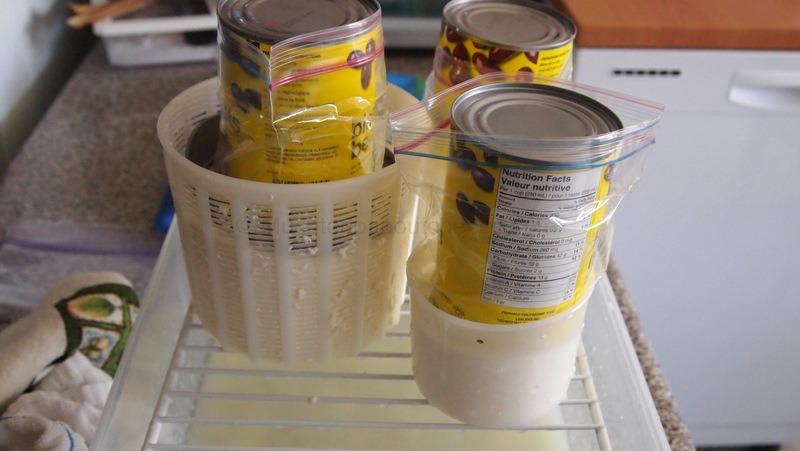 You can see the whey seeping out, and that I am not using cheesecloth. 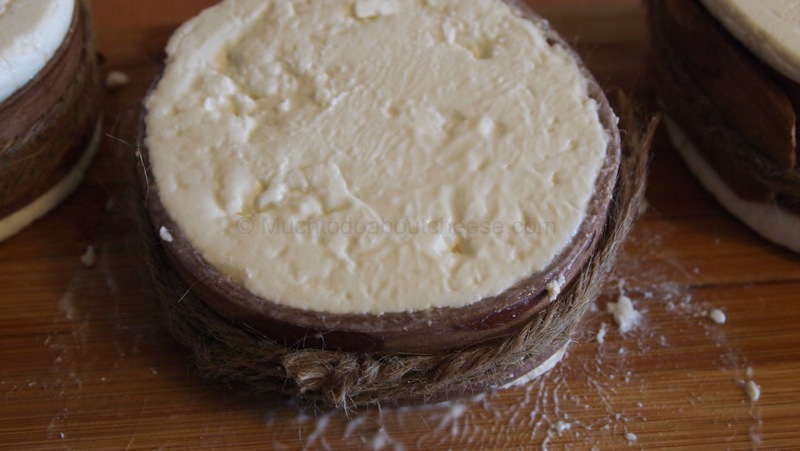 There was minimal loss of curd even without the cloth. After 4 hours of pressing the weights were removed and the cheese was moved to the basement in a ripening box to sit for 16 hours, this allowed the pH in the cheese to drop and gave me time to take a break. 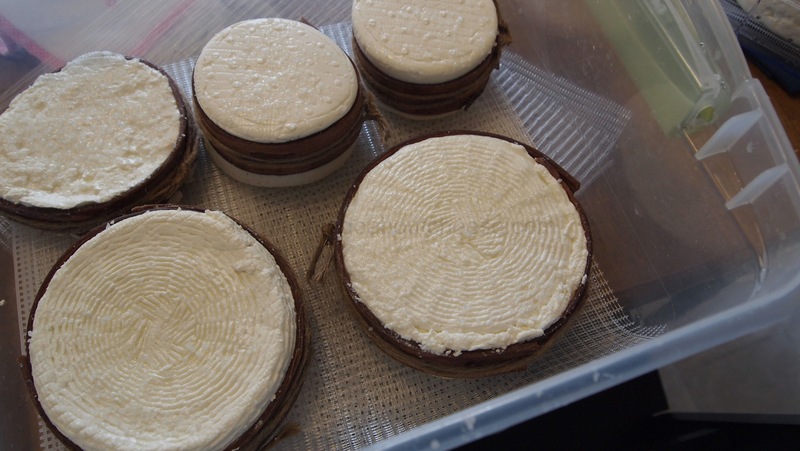 The next morning it was time to heat up the spruce and wrap some cheese. Here they are in the water after almost 45 minutes. 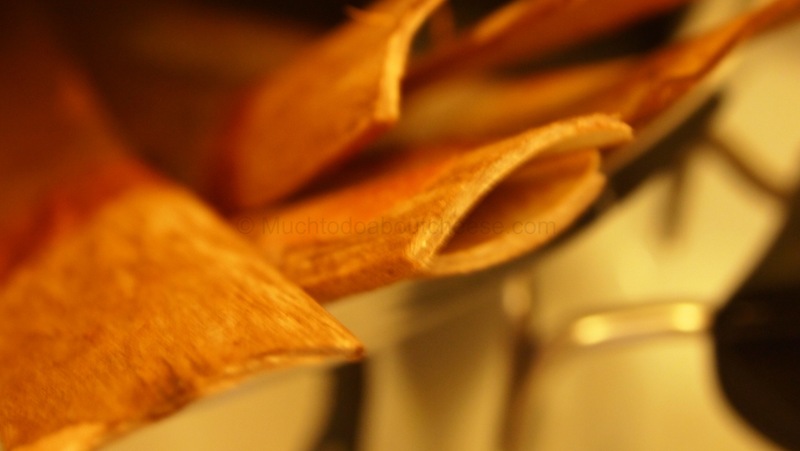 They were nice and pliable. 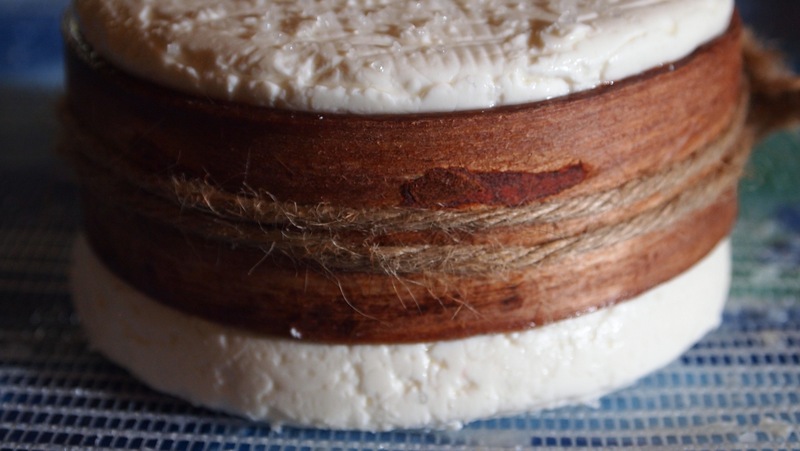 It was time to start applying the straps to the cheese, I used a nice twine to give it a rustic look, that and I could not pierce the wood with the cheap toothpicks I had. I tied on the straps, and salted the cheese. 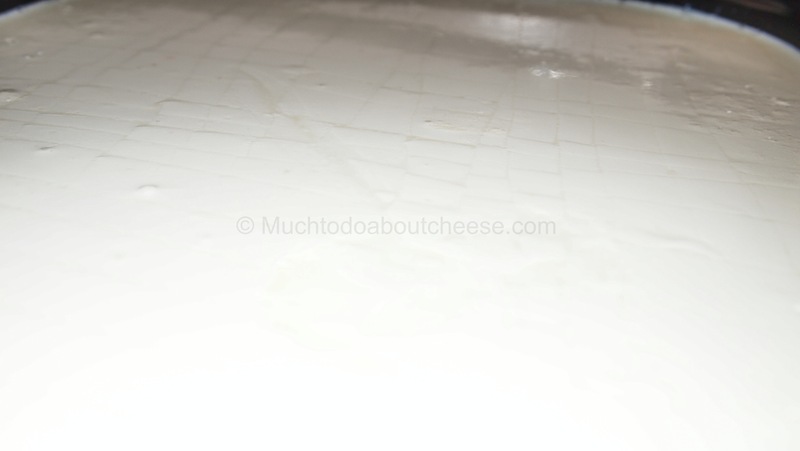 The cheese went into the ripening box and back to the basement. It did not take long for the salt to melt into the cheese and when I checked later that night they were swimming in whey. I put them on cutting boards that my wife was not using and they seemed to drain better. This one did not get a spruce strap but only because I ran out. This one will still get the ale wash. 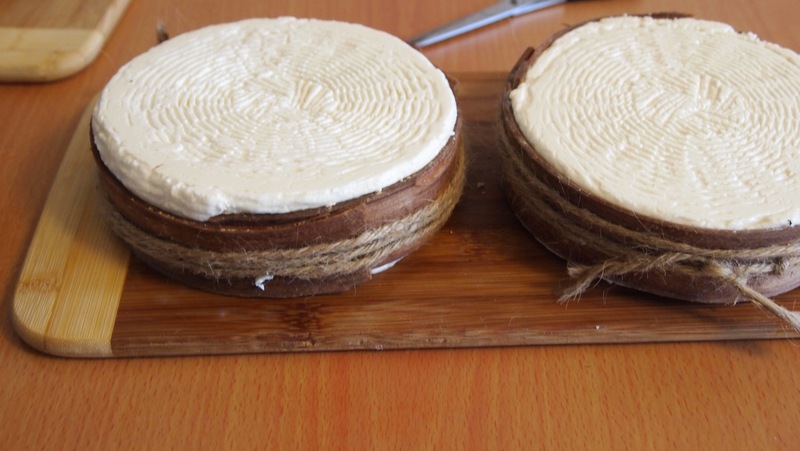 These are the ones made from the basket mould. I really wish I would have centred the strap, it will be interesting to see how this turns out. This is my “Ugly Duckling” one, it was banged up and squished to fit in the strap. This one seems to be holding up well. Of the three little ones, it looks the best. So with the cheeses flipped and the boards wiped down it was time to put them back into the basement. My basement is about 16C and it is the right temperature for the yeasting phase. When the Geotricum starts to bloom in a few days I will start to was the rinds. I will be following the same wash cycle I used for Reblochon. Day one wash top, day two flip wash new top and sides, repeat. Of course I won’t be washing the sides but the top that is not touching the wood will be. I will try to all the pictures of the make up on the Facebook page in a few days. I am trying to play catchup on a few things. So until next time go and make some cheese and have fun doing it. 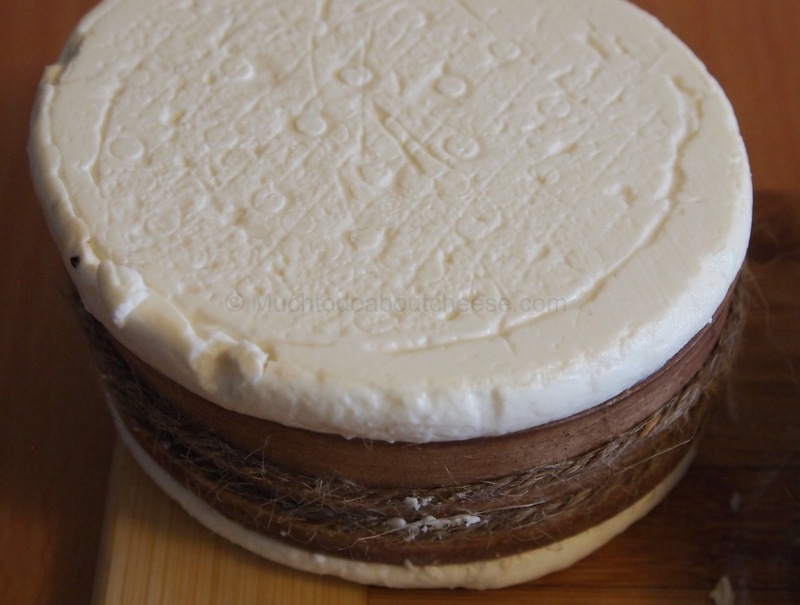 ← And Queso Was Its Name-O! 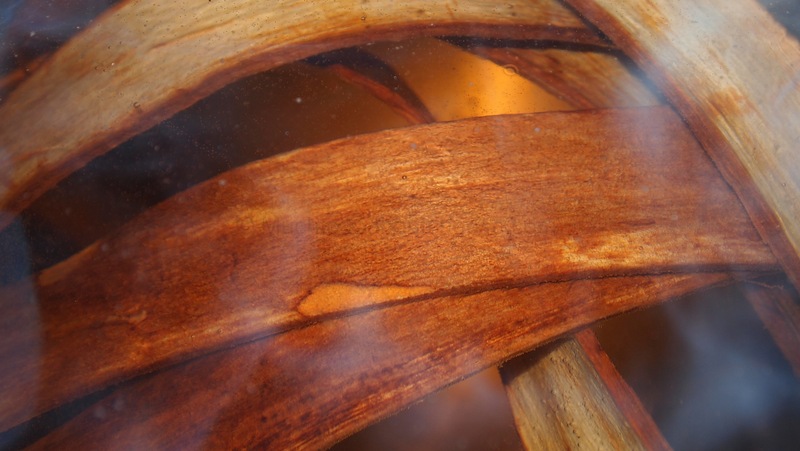 Thank you for the pictures and rich descriptions…it inspires me and all my DIYing!!! Thank you for your kind words, I am glad you enjoy the blog and am honoured that it inspires you. 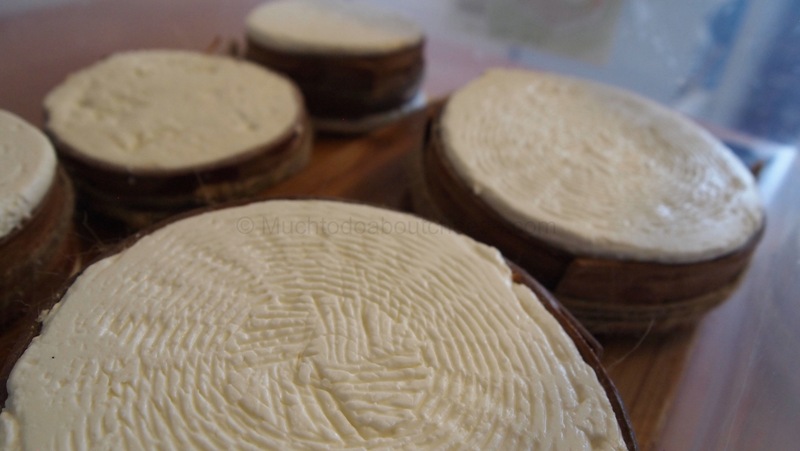 Thank you so much for spending the time to post your cheesemaking updates with so much detail. 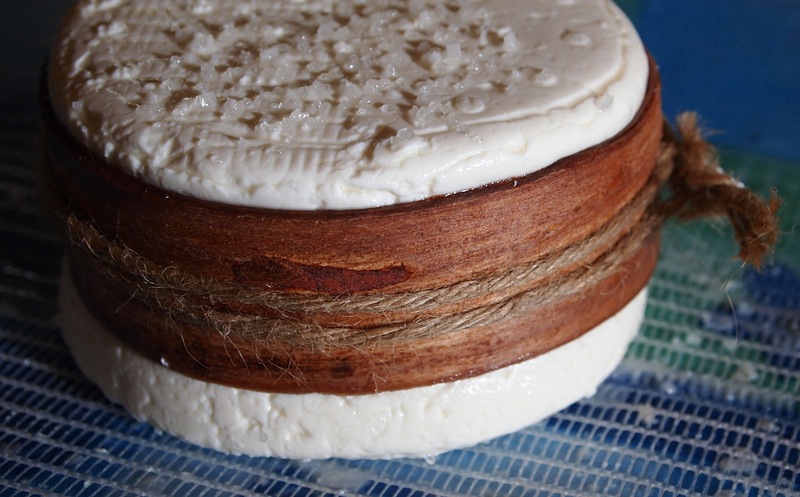 I knew from the images that your washed rind cheese is what I dream of making to eat. 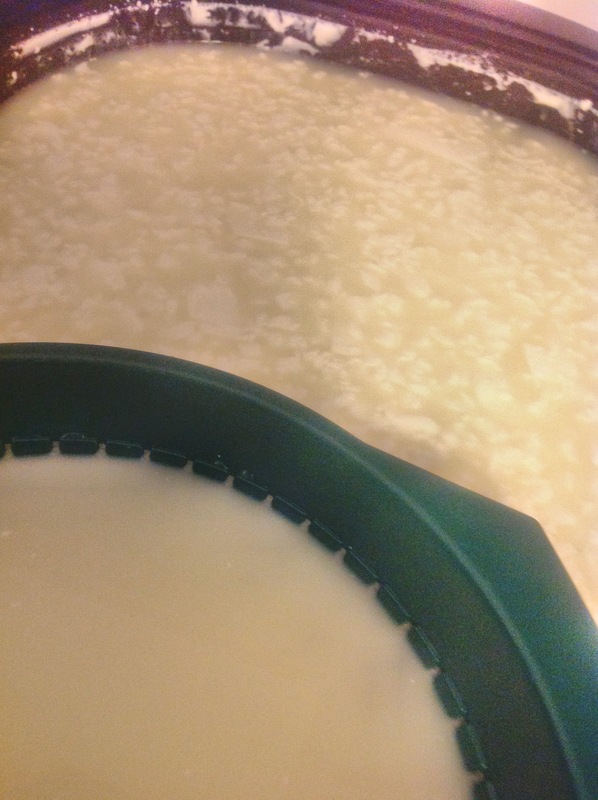 Your posts have helped me immensely I just wish I’d found them sooner because I’m 4 weeks into my 1st batch and the rinds had because slightly slimy (every day ATM I’m having to wipe them down). I propagated the rinds with a wash with some rind from Stinking Bishop so it’s no guarantee as to whether it will work or not. 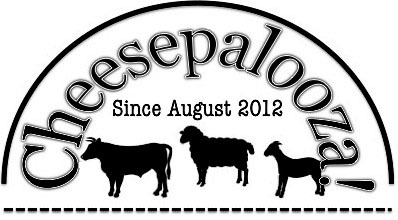 Keep up the great work and I will continue to devour your posts and hopefully my own cheese soon . 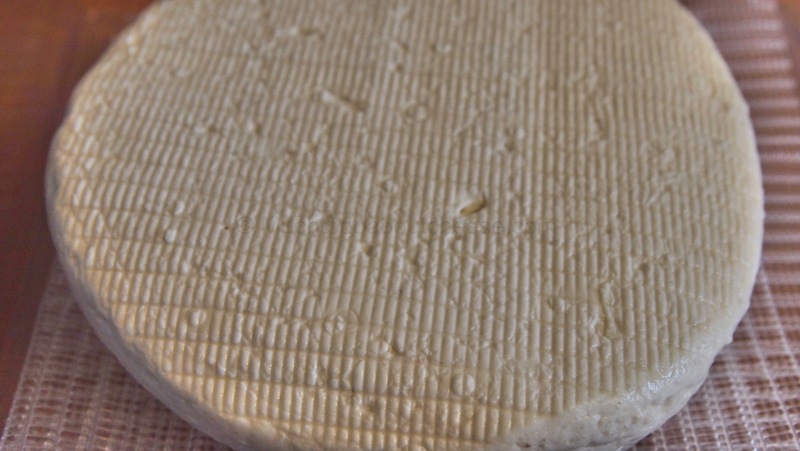 Slimy is good when you are working with washed rinds. Just let hem do their I got and cut back on the washes, maybe 2 times a week. Ere could be some geotricum I the Bishop rinds so the slime might be from that. Thanks for the kind words. I make these with some slight variation professionally now.